The new buzzword for coal-fired power plants is HELE, an acronym for High Efficiency Low Emission. According to a recent International Energy Agency (IEA) report, Japan’s 600 MW Isogo plant in Yokohama is probably the best in the world. It is an ultra-supercritical HELE plant, with emission levels comparable to a natural gas combined cycle (NGCC) power plant. The IEA report compared coal-fired power plants around the world, and found, not surprisingly, that the United States lags far behind. The average efficiency of U.S. coal-fired power plants is 33% HHV. But, China is quickly commandeering the leadership position. While the average efficiency of its coal-fired plants is currently 38.6% LLV, the only type of coal-fired power plant currently being built are HELE ultra-supercritical plants. The 1,000-MW ultra-supercritical Guodian Taizhou II Unit 3, HELE plant, in operation since September 2015, has an efficiency of 47.8% LLV. Reportedly, all coal-fired plants in China must be HELE plants by 2020, though that target may be hard to meet. This will help mitigate air quality problems in China, but not resolve them because other sources of pollution, such as automobiles and industries, are major contributors of pollutants. The United States has one HELE ultra-supercritical coal-fired power plant in operation. J. W. Turk HELE power plant. Coal handling equipment in foreground. Cooling towers emitting steam on the right. 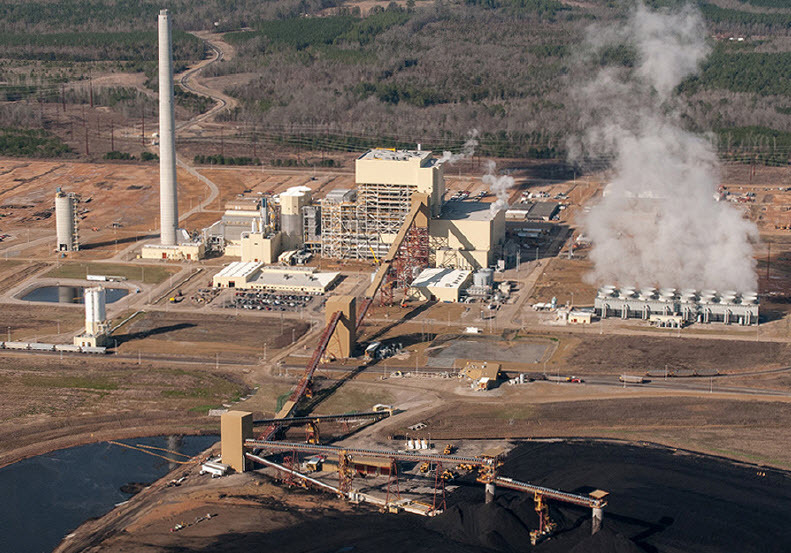 The 665-MW John Turk Jr. ultra-supercritical plant in Arkansas achieves an efficiency of 42% HHV, and was built before the EPA established regulations limiting CO2 emissions that prevent building HELE ultra-supercritical plants. The EPA rule established on August 3, 2015, prohibits any new or reconstructed plant that emits more than 1,400 pounds per MWh of CO2. While HELE plants can come close, they may not be able to consistently meet this regulatory requirement. Japan and China are demonstrating that HELE coal-fired power plants are nearly the equal of NGCC power plants, in so far as pollutants are concerned, and that they can nearly meet the EPA CO2 regulation. The United States has huge reserves of coal that can be used for generating low-cost electricity: Levelized cost of electricity (LCOE) that is roughly the same as NGCC power plants. As long as natural gas prices remain below $3.00 per million BTU, NGCC power plants will produce the least costly electricity. But when natural gas prices are higher than $3.00 per million BTU, coal can be competitive. Both produce electricity at far lower costs than either wind and solar. With HELE ultra-supercritical plants now being built-in Japan and China, it would seem the United States should follow suit, so that the average American can benefit from low-cost electricity. Personally I would prefer to generate our electricity using these high tech coal plants than using our Natural Gas which in my mind should be saved for home heating and other use. Coal is a natural resource that we have 400 years supply. It’s really unfortunate that we are being denied an opportunity to use it.